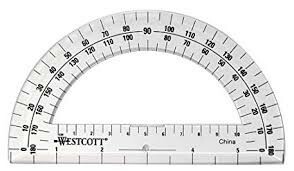 And showed me how to use it to measure these things called “angles.” I remember leafing through this book and coming upon this really neat “fact,” namely that the sum of the measure of the angles in any triangle is 180 degrees. Now, this was interesting! I knew what a triangle was, I knew how to measure angles, and I knew how to add. This was something I could explore! So, dutifully, I began sketching triangles in my notebook, measuring the angles, and adding up the results. And, I quickly discovered something quite odd – my measurements didn’t always add up to 180. Sometimes I’d get 179.5 or 178 and sometimes 181 or 182. What, I wondered, was going on here? Was this magical book wrong? Had I discovered something new? 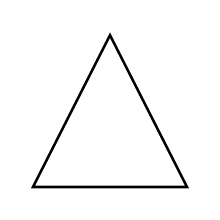 A triangle is a polygon that has precisely three sides. But, you ask, are triangles real? And, this is where the confusion begins. This is not an easy question. Plato believed that they were real and that somewhere there existed, in the same sense as my cat exists, this “abstract world of forms” populated by things like triangles and continuous functions and notions of “catness.” Plato believed that this abstract world of forms was the primary reality and that the world of substance and matter which we inhabit was but a mere shadow of this abstract world. Of course, Aristotle disagreed and argued that no such world of forms existed and that our world of substance was the primary reality, that is, it was the world that my cat inhabits that is actually “real.” Plato and Aristotle’s disagreement sits in the center of the famous picture, “School of Athens” by Sanzio, which hangs today in the Vatican. 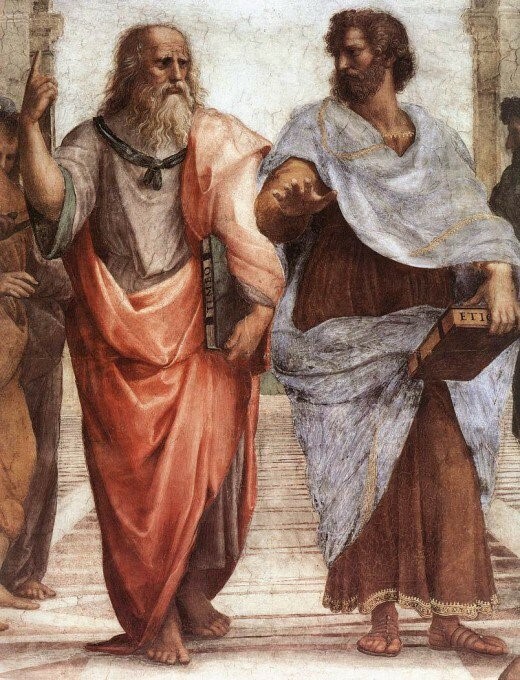 Plato, on the left, points upward toward his “world of forms,” while Aristotle, on the right, points forward to what’s in front of us. Mathematical modeling is a process that uses mathematics to represent, analyze, make predictions, or otherwise provide insight into real-world phenomena. There is much debate and angst that arises around the very last part of that definition, namely the use of the term “real-world.” Some argue that triangles are “real” to children in a way that irrigation systems are not and hence conclude that doing any form of mathematics is doing mathematical modeling. This is, of course, where one falls into the trap of equivocation. In arguing in this way, one changes the meaning of “real-world” from indicating Aristotle’s world of substance and things to meaning “familiar to me whether it’s part of the world of substance or not.” This equivocation is the challenge and the fault. We need to use “real-world” in the sense that it’s intended by those who state definitions such as are found in the GAIMME report. We can’t arbitrarily change that meaning any more than we can change the meaning of “polygon” in our definition of triangle to include objects with curved sides and still expect our definition of “triangle” to make sense. But, does this really matter? What’s lost if we change the meaning of “real-world” to be a subjective one that means “anything with which I’m familiar”? This is the truly important part. In making that shift, all is lost. All that is special, and powerful, and unique about this practice called “mathematical modeling” is dependent upon this connection to the “real world,” where here, the “real world” means the physical world, the natural world, Aristotle’s world of substance, or what we commonly refer to as the “universe.” The magic of mathematical modeling is that it connects Plato’s abstract world of forms (whether you believe in it or not) to Aristotle’s world of substance. I couldn’t be in San Francisco last week for the Mathematical Sciences Research Institute’s workshop, “Critical Issues in Mathematics Education 2019,” which focused on mathematical modeling in the K-16 world. Fortunately, we no longer need to wait for proceedings to be published before we can share in such meetings and today, through Twitter, YouTube, and the MSRI website we can follow the discussion quite easily. On Thursday morning, there was an interesting panel discussion featuring Sol Garfunkel, Dan Meyer, Nina Miller, Annalee Salcedo, and Erin Turner that subsequently generated a lot of noise on Twitter and apparently a good deal of discussion at the meeting. So we might as well start this fight right now. I think Dan is completely wrong. The reason we wrote the GAIMME report was to put out a standard definition of modeling. Now you could use another definition. But the definition of mathematical modeling in the report and the one all the people I know who work in the field agree on is that it begins with a real-world problem. Let’s take a look at Dan’s remarks and see if we can understand exactly where he went “not even wrong.” Dan starts out okay with the easy crowd-pleaser of criticizing a textbook problem labeled “CCSS Modeling” that well, clearly isn’t. It’s worth noting that Dan doesn’t describe why he thinks this particular task isn’t mathematical modeling, but just takes his shot and moves on. One gets a first inkling of the “not even wrong” level of confusion here when one realizes that by Dan’s later definition of modeling, even this example is actually modeling. 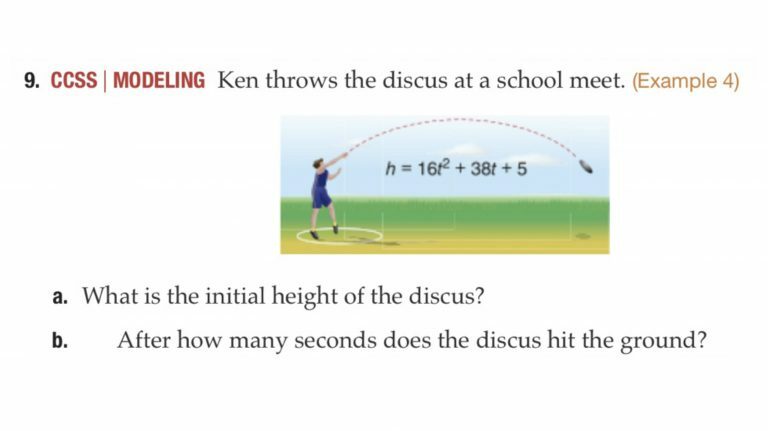 So, we started by criticizing textbook publishers for “calling any problem modeling for the sake of a good alignment score for their textbook” but later even this example is modeling? What? Okay, this is not going to be easy to untangle. Dan’s next attack is aimed in a different direction, this time, at the authors of the GAIMME report. He claims that these authors have placed modeling on a mountain “that is far too high for any mortal teacher to climb.” His main critique here seems to be that the report is just too long. Two hundred whole pages! Who could read such a thing!? Forget for a moment the fact that this ignores entirely the “How to use this document” section of the GAIMME report which suggests that readers read the introductory chapter and then skip to the chapter on their grade band of interest, significantly shortening the reading time for any given individual. Instead, think about this claim – a 200 page document is simply too long for any practicing teacher to read in order to learn about a new topic with which they are unfamiliar and which they wish to bring into their classrooms. To me, this shows a stunning lack of respect for teachers as professionals. Dan, I think you could have looked to either your left or right and found teachers like Nina Miller and Annalee Salcedo sitting next to you who clearly would and did read the GAIMME report. I think we need to have more faith in teachers. This is a nice definition. It tells us the class of things that mathematical modeling belongs too, namely those we think of as “process,” and tells us the specific difference between the process of mathematical modeling and all other processes. This process is one that uses mathematics in a particular way to uncover things about real-world phenomena. Large chunks of the rest of the document work to unpack and explore this definition and even to provide alternative, equivalent definitions, but I certainly don’t feel that I need to give Sol a call every time I want to check something against this definition. But, this is still warm-up. Dan is just setting the stage for his new and improved definition of “mathematical modeling” which, wait for it, is “All learning is mathematical modeling.” So, I guess when my cat learns that the sound of a can opener means food is about to arrive implies that she’s doing mathematical modeling! Heck, this is easy! We don’t need to do anything at all to teach mathematical modeling, even a cat can do it! Let’s all just keep doing what we were doing, nothing more to talk about here. This, of course, is really where Dan has his “not even wrong” moment. By ignoring (ridiculing?) the work that folks like Sol Garfunkel and others have done to attempt to define and explain this absolutely essential mathematical practice that yes, we call “mathematical modeling,” and by replacing it with “all learning is modeling,” Dan unfortunately engages in the worst possible form of equivocation. And, that’s a shame. Dan’s built a following because he’s said a lot of sensible and important things about mathematics teaching and learning. But, this time, he’s taken a wrong turn and gone down a road that I’m afraid leads to a dead-end. Not just for him, but for the students of teachers who follow him down that road. The fact is, mathematical modeling is an essential mathematical practice. It’s one that’s been practiced for hundreds of years. Galileo did it. Newton did it. Einstein did it. And, today, thousands upon thousands of scientists, engineers, mathematicians, economists, social scientists, finance professionals, data scientists, and countless others rely upon this practice to continually push forward our ability to understand the world around us. It’s not a simple practice. It’s harder than guessing the next number in a sequence and it’s different than making conjectures about polygons. 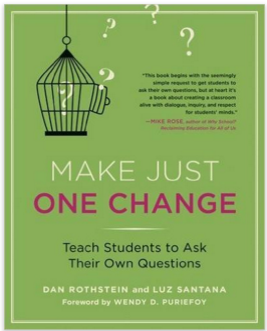 But, it’s worthwhile, and I believe, it’s attainable for teachers throughout K-16 and their students. Today, there are more resources available than ever before to help teachers at all levels get started in the classroom. The GAIMME Report is a good start. Sol Garfunkel’s COMAP organization provides multiple such resources including the jointly sponsored Mathematical Modeling Hub. Heck, there are countless blogs like this one and folks across the country and across the K-16 spectrum working to develop new resources and working with teachers to support them in mastering and teaching the essential 21st Century skill of mathematical modeling. So, let’s put aside this “not even wrong” conception that “all learning is modeling” and focus on the real work and the real-world work that remains to be done. Some time ago, I had the pleasure of spending part of my summer working with a local high school teacher (Chuck Biehl), an undergraduate mathematics education major (Alexandrea Hammons), and a math education faculty member (Alfinio Flores), on a project we just called the “Bubble Board.” At the time, our interest was in developing a simple hands-on project that Chuck could take back to his classroom and where his students could gather data and learn a few things about curve fitting using a data-set they’d gathered themselves. We wrote this up as an article for the Ohio Journal of School Mathematics. You can find the full article here. Today, I thought I’d revisit this project and talk a bit about it from the perspective of mathematical modeling. The Bubble Board is a great system in that it’s very simple to build and use, and in that students can gather data using nothing more than a stopwatch, a pencil, and paper. At the same time, the behavior of the system is interesting, and yet mathematically accessible for a wide-range of students. The Bubble Board was originally designed by the physical chemist, Goran Ramme of Uppsala University in Sweden. Like many scientists before him, from Isaac Newton to Lord Rayleigh, Ramme’s been fascinated with soap films. It was from his wonderful 2006 book, Experiments with soap bubbles and soap films, that I first learned of the Bubble Board. As you can see, the system is simple. You have a latex sheet with an array of 56 identical, evenly spaced holes drilled into the sheet. Through each hole, you place a soda-straw so that about 2cm of the straw pokes through one side and the rest of the straw hangs below. The short end of the straws are then dipped, en masse, into a soap solution creating a flat soap film over the top of each straw. The board is then flipped and the long-end of the straws submerged in a water tank. The water, of course, rises in each straw and the resulting pressure “blows” a bubble at the other end of the straw. You end up with an array of identically-sized soap bubbles. Now, Ramme approached the Bubble Board from the perspective above. That is, he approached the Bubble Board as a tool for measuring the lifetime of a large array of bubbles simultaneously, thereby building a picture of the distribution of bubble lifetimes and gaining insight into the average lifetime of a soap bubble. We approached the Bubble Board from the point of view of dynamical systems. That is, if you create this array of identical bubbles all at the same time, how does the population of bubbles evolve with time? Or, more simply – How many bubbles will be left at time ? The dynamical systems perspective brings the Bubble Board into the world of population dynamics. This is of obvious interest in fields like ecology, where one wants to understand how the population of a given species, or group of species, changes with time. The study of population dynamics and the mathematical modeling of these types of problems has led to much beautiful and interesting mathematical work of broad applicability. In this figure, the different colors indicate different types of soap solution, but here, let’s just focus on the purple or blue data points. Clearly, the data is not purely exponential. 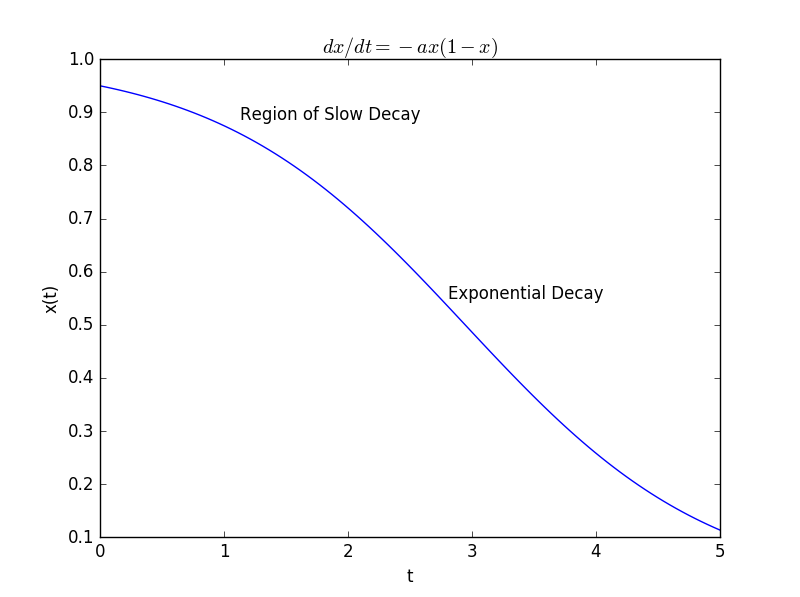 For some reason, the decay curve starts out somewhat flat and then exponential behavior seems to take over and drive the decay. Now, I haven’t put this discussion in the context of the modeling cycle, but hopefully you can see this as an example of how the cyclic nature of mathematical modeling arises naturally through comparison of model prediction and real-world data. We started with our hypothesis about how the system should behave, built our mathematical model and predicted a decay curve that was purely exponential. But, when comparing to the real-world, we see that we were clearly wrong! Well, we got the decay part right and part of the curve looks exponential, but certainly, there is some important behavior in our system that our model is not capturing. So, we need to go back and revise our model and see if we can glean a deeper understanding of our system. Thinking about our array of bubbles a little more carefully we realize that if it’s true that bubbles have a common average lifetime, then near the start of the experiment very few bubbles should actually be popping. For example, if your average bubble lives for one minute, then near time zero, i.e. 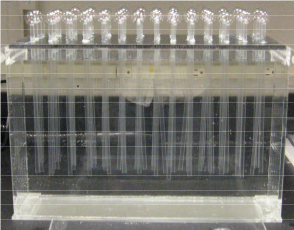 the start of the experiment, only a few “outlier” bubbles should pop. Most bubbles should persists and then as time gets close to one minute we should start to see your typical bubble pop. 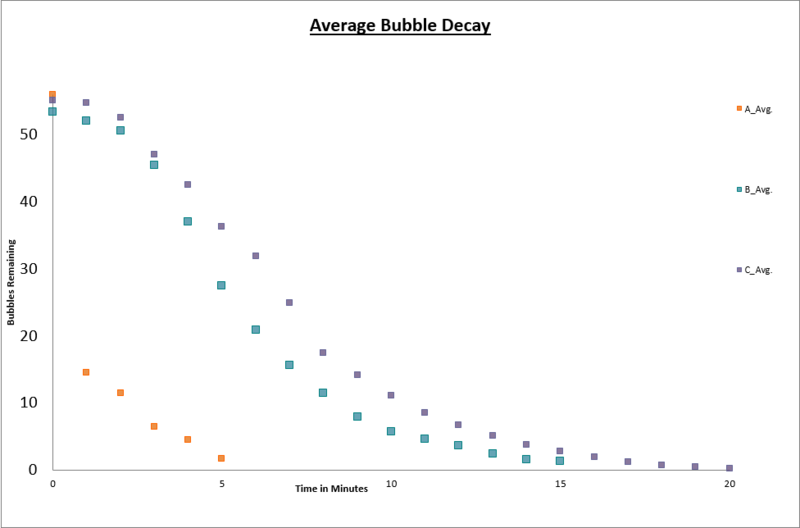 Here, the behavior should look like exponential decay as when your “average” bubble is popping, the number popping should be proportional to the number of bubbles you have. As you get well past one minute, you should again only see your “outlier” bubbles and they too should eventually pop. So, we can feel a bit more comfortable in that our model captures the real-world behavior more accurately. Of course, more work remains to be done! How, for example, does the constant in our new model relate to properties of our soap bubbles? How does the constant relate to these properties? Is there some reason to believe our variable rate is the right one? Hopefully you enjoyed our detour into Ramme’s Bubble Board and can see it as a hands-on way to introduce your students to some interesting mathematical modeling questions and to the broader topic of population dynamics. The system lends itself to investigation by students across a wide-range of mathematical background, so whether you investigate the simple problem of predicting bubble size as a function of the depth the straws are submerged in the water, or the more complex problem of predicting how the population size changes with time, I think you’ll find something here to enjoy. Well, the last few months of 2016 went by much too quickly and unfortunately left me with little time to post. But, it’s a New Year, and I’m anxious to get back to talking about mathematical modeling. So, Happy New Year! Now, let’s get back to work. Recently, I found myself thinking about several points that we’ve explored in earlier posts. One of these, explored in “Caught or Taught?“, is the idea that mathematical modelers often draw upon a library of canonical mathematical models that they have at their fingertips when they approach a new problem. That is, they often reason by analogy, and use situations and models with which they are familiar as a starting point for thinking about new, unfamiliar, situations. The second point that’s been on my mind is the one explored in “Arduino as a simple tool for hands-on modeling activities,” and is the idea that the widespread availability of low-cost microcontrollers and sensors opens up new possibilities for hands-on activities in the modeling classroom. For many years at the University of Delaware, I’ve taught a mathematical modeling course where we’ve had students engage in hands-on experiments in our own laboratory. I’m constantly amazed that experiments which cost us thousands of dollars to perform just ten years ago can now be carried out at home on your desktop with just a few dollars in equipment. To carry out this project, I enlisted the aid of my daughter, Julia, and this weekend, we spent time playing with potatoes. What more could a high-school student ask from their weekend? The question that we sought to answer was this – Which cools faster, a large potato or a small potato? Somewhat surprisingly, when we polled a few unwitting participants as to their answer to this question, two schools of thought emerged. One school of thought held that the small potato would cool faster as it “held less heat” and hence as it shed energy its temperature would drop faster. The other school of thought held that the large potato would cool faster as it had a larger surface area and that the rate of its losing energy would be hence be greater. Who’s right? Here, the unknown is the potato temperature, . Room temperature is and initially the potato is at some higher temperature, . There are four parameters in the model. 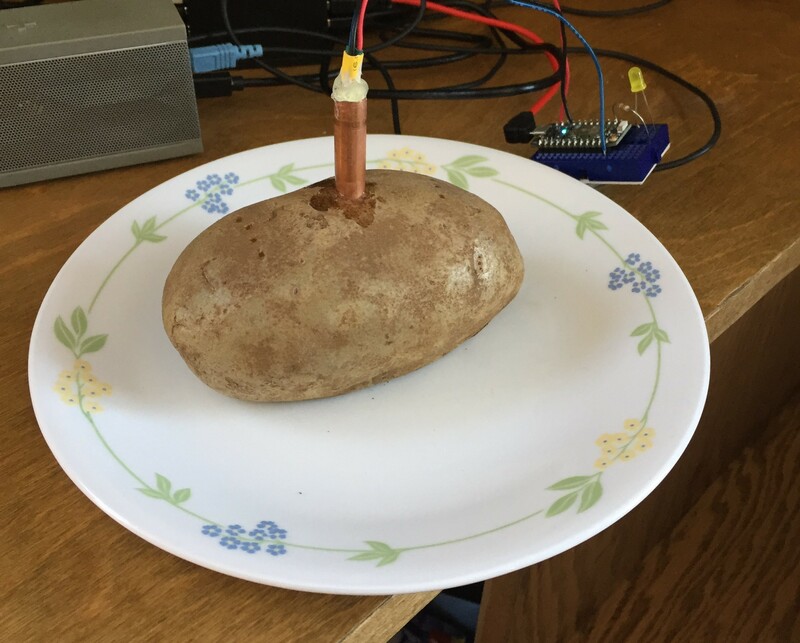 The mass of the potato, , the specific heat, , which measures the amount of energy needed to raise a unit mass of potato one degree in temperature, the surface area of the potato, , and the heat transfer coefficient, , which measures how fast the potato loses heat energy to the surrounding environment. We note that this model can be thought of as a statement of the principle of conservation of energy. 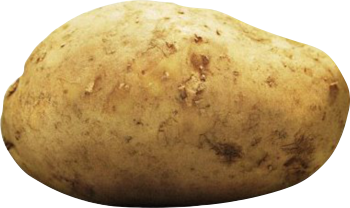 The equation simply says the change in the energy of the potato is equal to the energy lost to the surrounding environment. The left-hand term is this change in energy, and the right-hand term relies upon Newton’s Law of Cooling which says that the energy lost to the surrounding environment is proportional to the difference between the temperature of the body and the temperature of the surrounding environment. and hence our mathematical model leads us to predict that this particular small potato should indeed cool faster than this particular large potato. Our next step was to conduct some potato experiments. But, before we go there, let me point out another problem for future exploration. We’re making a prediction for our particular two potatoes. 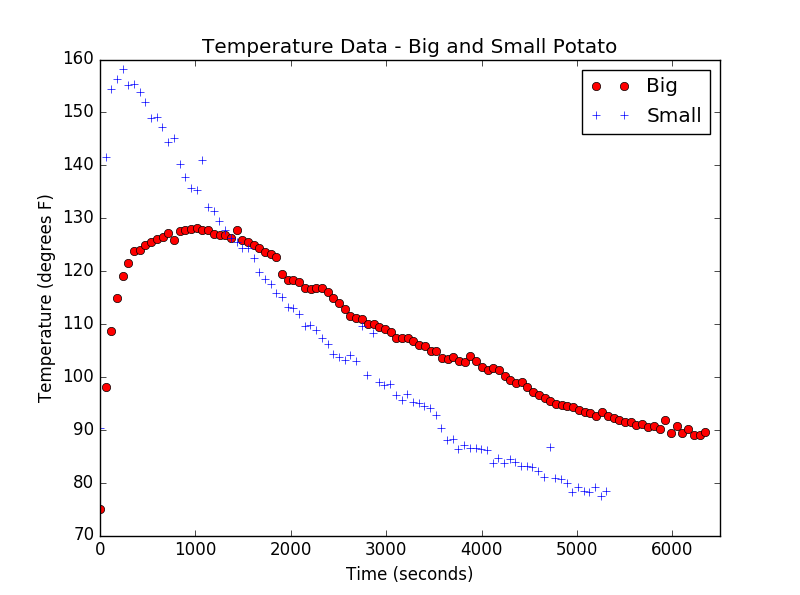 In this case, we predict that the small potato should cool faster than the large potato. But, is this always going to be the case? Surely, if we took our large potato and stretched it out into something resembling a giant French fry it would cool faster. Wouldn’t it? How does our ratio, , depend on potato shape? Can you find two potatoes that you would call “large” and “small,” where the large potato should cool faster? As you can see, the small potato achieved a higher temperature initially, but, as predicted, cools at a faster rate. Since we placed each potato in the microwave for the same length of time and the small potato has smaller mass, it makes sense that its initial temperature should be higher. The transient behavior at the start also makes sense – it takes time for the probe to get to potato temperature. It’s exciting to see that our model and our analysis of yield a correct prediction about which should cool faster. By this point, Julia’s potato-patience was wearing thin, so we left further analysis for another day. But, here’s one final suggestion for exploration for you and your students. 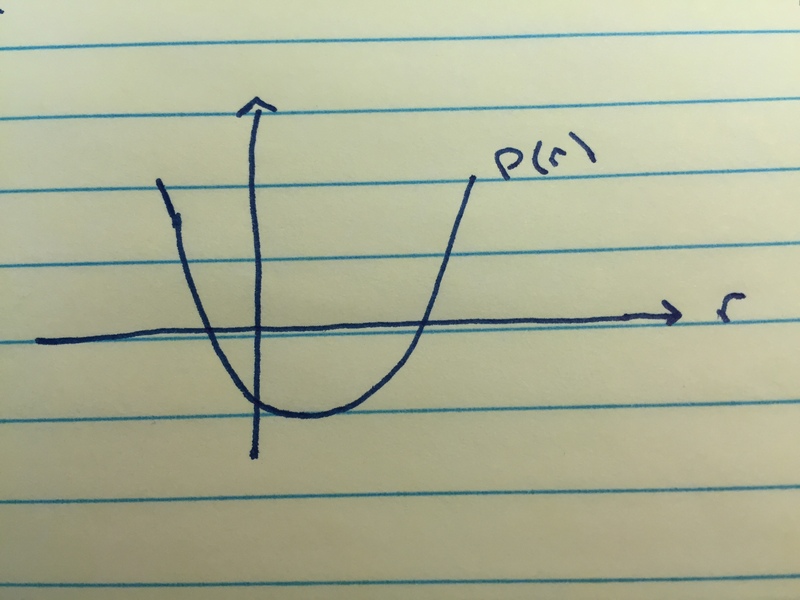 If you take the data above (or your own data) and fit an exponential to the exponential part of the curve, your fit will give you an experimental value of for that potato. If you take the ratio of the two values, how close do you get to ? Well, I hope you’ve enjoyed thinking about this canonical mathematical model and thinking a bit about hot potatoes. Best wishes for a fun year of mathematical modeling! import numpy as np #Used for creating vectors, etc. import statistics as stat #Used for computing median, etc. #the user. That is, this function applies basic median filtering to the measurement. Today was the last day of this year’s NSTA STEM Forum and bright and early tomorrow morning I’ll be headed back to Delaware. I want to thank NSTA for a great conference and I want to especially thank all of those who joined me for one of our two NCTM workshops on mathematical modeling. I really enjoyed working with all of you and hope to have that chance again in the near future. I’ll repeat the offer I made at the end of each workshop this week – please feel free to tweet or email anytime with your questions, thoughts, or comments about mathematical modeling! I love thinking about this stuff and love hearing from math and science teachers working to implement mathematical modeling in their classrooms. At this week’s STEM Forum there were a massive number of fascinating sessions offered. So much so that it felt like for each session I attended, there were a half dozen that I had to miss that I really wish I could have attended! So, today, for those of you who couldn’t join us for our NCTM workshops, I’ll give a brief recap and provide the slides and a few other related materials. Along the way, I want to share and explore some of the excellent thoughts and ideas offered by participants during and after these workshops. I apologize in advance for not having the foresight to write down names! If you recognize yourself below, please drop me a line and I’ll correct this oversight. One more stylistic note before we begin – our two workshops (middle and high school) were essentially the same, with the math explored in the high school session being slightly deeper than in the middle school session. So, below, I’ll just say things like “in our workshop” or “Our workshop began” for simplicity. We began the workshop by sharing a short story that appears at the start of the physicist Eugene Wigner’s famous talk “The Unreasonable Effectiveness of Mathematics in the Natural Sciences.” I won’t reproduce the story here, but if you follow the link, we shared the first paragraph of Wigner’s talk. We then spoke briefly about this idea, the idea that there is this incredible power, a power that verges on the mysterious or miraculous, afforded to us once we understand how to use mathematics to understand the natural world. We talked about this as the basis for answering the question “How do we put the M in STEM?” and we asked participants to share their experiences and their challenges with incorporating mathematics into STEM activities. Participants shared some very real and very pressing concerns that we need to overcome if we’re to be successful in putting the M in STEM and if we’re to be successful in implementing STEM overall. These included overcoming the discomfort that many math teachers feel with science and many science teachers feel with math. One participant noted that to overcome this, we need to find time and space for science and math teachers to collaborate and to work together. Absolutely! Another participant noted that if you looked at the NGSS and the CCSSM, they are almost forcing this to happen. These are excellent points and I want to emphasize them here – if we are going to effectively teach students the art of mathematical modeling, it is crucial that we learn to work across math and science. Yes, one can do mathematical modeling using contexts that require little understanding of science, but the full power of mathematical modeling is only really unleashed when we’re involved in a deep scientific investigation of phenomena in the natural world. Next, we spent some time talking about the overlap in the practice standards between NGSS and CCSSM. In particular, we talked about SMP #4 – Model with mathematics, from CCSSM and Practice Standard #2 – Developing and using models, from NGSS. We spent some time exploring how the NGSS standard encompasses the CCSSM standard, with mathematical models being one type of model talked about in NGSS. The key idea we explored was this relationship, the idea that mathematical models are really scientific models encoded in the language of mathematics. Then, we spent some time looking at a STEM activity and where mathematical modeling fit into the picture. The activity we discussed was the Great Lakes problem that I’ve talked about here. Participants spent some time working to construct a mathematical model of the Great Lakes system and at the end, shared their results and their thinking. 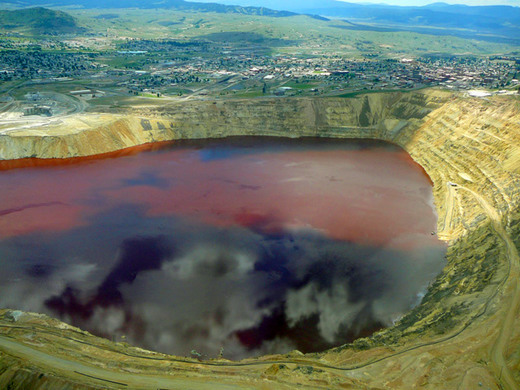 Apparently, this is an abandoned copper mine, huge in scale, that is slowly filling with water. 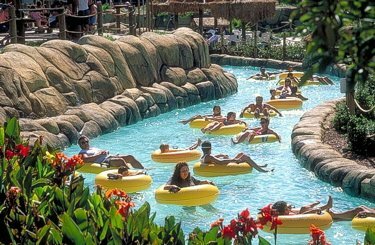 The problem is that the water is incredibly contaminated and that eventually the water level will rise to the level of the local water table. When that happens, backflow will occur, contaminating local and regional water supplies. This is clearly a source of many wonderful STEM and mathematical problems. I’ll think about this one some more and I’m sure will post more about this one. Thanks for sharing! Another problem shared by a participant, was one she does in her class. In this project, she has students read the book “The Immortal Life of Henrietta Lacks” and then explore changing concentrations of drugs in the body. As her experimental system, she has students start with a beaker filled with water and a certain amount of dissolved salt. They measure the mass of the system, then remove a small quantity of the “drug filled water” and replace it with an equal amount of clean water. Then, they measure the mass again and repeat. Tracking the mass measured each time, they uncover the curve that describes the changing concentration of the “drug” in the system. Mathematically, this is identical to the Great Lakes problem we explored in this session and a great example of the generalizability of mathematics. That is, we often discover that mathematical models we’ve built of one system are able to describe what we see happening in lots of systems. This happens when the underlying processes are the same, as they are here. Again, thanks for sharing! Thanks again to everyone who participated this week! Please feel free to email or tweet anytime! Looking forward to more great conversations about the art of mathematical modeling. This week, I’m in Denver Colorado for the 5th annual STEM Forum and Exposition organized by NSTA. Later this week, on behalf of NCTM, I’ll be running two short “NCTM sessions” on mathematical modeling. In these sessions, we’ll explore the question “What should the “M” in STEM look like in a good STEM activity?” Later this week, I’ll post more about these sessions and the STEM forum, but today, I want to talk about my plane ride. The pivot arm is on wheels all along its length. At various points along this radius, motors of some sort drive the motion. Since this is a radial motion, the motors furthest out must be going faster than the motors closest to the pivot point. How is this motion coordinated? How does this need to increase the motor speed with radial distance impact the largest such circle that’s practical? Since water is being forced from a central point, the water pressure must drop as we move outward along the radial arm. 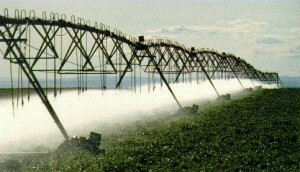 This means that if all sprinklers were identical along the arm, the crops closest to the pump would get over-watered, and those furthest out under-watered. How does one design a sprinkler system for this arm so that we deliver the same amount of water across the entire circle? While the arrangement of these crop circles clearly must follow, to a certain degree, local topography, why are they generally arranged in a less-than-optimal packing arrangement? 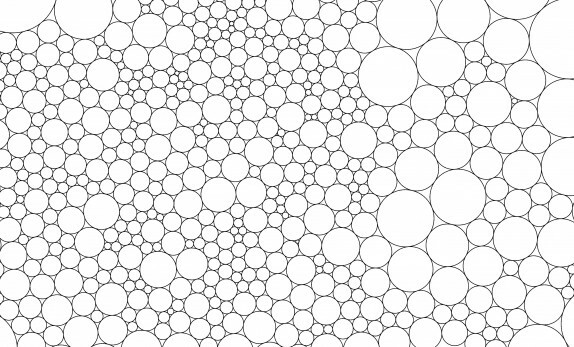 That is, we know that hexagonal packing of circles covers more area than the rectangular packing we observe. So, why do these circles generally follow the arrangement on the left rather than the right in the picture below? 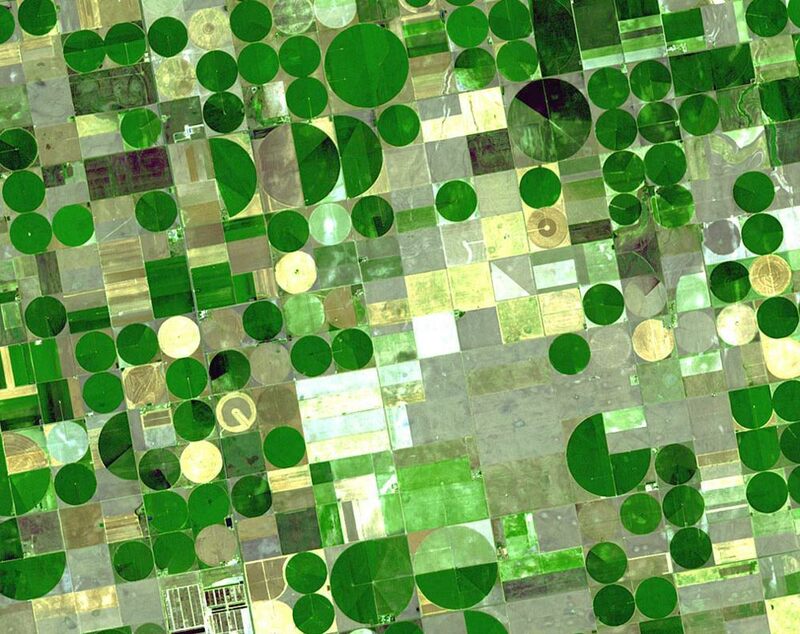 Why don’t farmers use circles across a greater range of sizes? Now, as with any good mathematical modeling problem or any good STEM problem, I imagine that the answers to these questions are complex, and involve multiple factors and multiple constraints. As my flight neared Denver yesterday though, I decided to see if I could at least convince myself that there was a good reason why we don’t see small crop circles by sketching out a really simple mathematical model. This was a “back of the airplane menu” type model, but nonetheless, fun to play with and I thought I’d share it with you here today. The fact that this curve becomes positive only at some finite positive value of means that, yes, there is a minimum size below which a crop circle just isn’t profitable. I’m convinced that our farm industry knows what it’s doing when it avoids making teeny-tiny circles. In fact, it seems that we should be driven to make our circles as large as possible (note that real circles cover hundreds of acres) and that there must be another explanation for why we only make them up to a certain size. I suspect that the maximum size of theses circles is dictated either by the demands of designing for the pressure drop across the sprinkler array or the demands of increasing speed of the motors as we move further out along the arm. Or, probably both. But, it was time to ask my neighbors to get up one last time so I could use the bathroom and then, quickly, my plane ride to Denver was over. I hope you’ve enjoyed my random flight musings and hope perhaps you’ve found some inspiration for some cool STEM problems here in this post. I’ll be sure to post again at least once more this week and share what I learn at this year’s STEM Forum. Till later. There are multiple paths open to the mathematical modeler, and no one, clear, unique approach or answer. Mathematical modeling authentically connects to the real world, starting with ill-defined, often messy real-world problems, with no unique correct answer. What do people, in particular, what do those of us who do mathematical modeling professionally, mean by such statements? What are we really trying to say with statements like “no unique correct answer”? There are actually multiple levels to this point, and I think it is worthwhile exploring a few of these levels here today. At the simplest level, such statements express the point that the answer to a modeling problem is not like the answer to a typical textbook or classroom math problem. When we think of the idea of an “answer” to a math problem, due to many years of repetitive training, what we most often visualize is a number. “The” answer is , or , or , or , or something like that. Perhaps, if we’re a bit more deeply immersed in algebra, or trigonometry, or calculus, our default vision of “answer” might be more like or or or some such expression. Note that this default vision of an “answer” is some form of mathematical object and tied to that, perhaps so intimately that we don’t see it, is the idea that this answer is easily checked. It’s the result of “doing the math correctly,” and hence, of course, we should only get one such answer. But, when we talk about the answer to a modeling problem, these are not the types of objects we’re talking about. In one very important sense, the answer to a modeling problem is a model. And, here is the first place where this idea of “no unique answer” comes into play. Because models of a given real-world situation can be constructed using wildly different mathematical tools and are based on assumptions made by the modeler, it is often the case, likely even, that two modelers approaching the same problem produce different models, i.e., different “answers” to the same modeling problem. This is the point that the first of the two statements from the APME volume above is really making. In situations like these, the models devised depend on a number of factors: How precise an answer do we want or need? What aspects of the situation do we most need to understand, control, or optimize? What resources of time and tools do we have? The range of models that we can create and analyze is also constrained by the limitations of our mathematical, statistical, and technical skills, and our ability to recognize significant variables and relationships among them. The point, of course, that Borges is making is that a big part of science, a big part of understanding the real-world, is about making models and that the only perfectly complete model of reality is reality itself, but that such a model is also completely useless! This is true whether we’re talking about physical models like maps or more abstract mathematical models. The magic is that maps and models, approximate, imperfect, and ignoring vast parts of reality are incredibly useful and are our best tools for understanding, predicting, and controlling that reality. If there were a top-ten list of “things that make math teachers cringe,” the question “When will we ever use this?” would surely be at the top. That’s pretty independent of whether you teach at the elementary grades, middle school, high school, or college. Quite rationally I suppose, most students want to know there is some utility in what they’re learning, that this lesson is not just another “eat your spinach, it’s good for you” type of lesson, but is something they’ll be able to see as relevant to their own lives and their own careers. One of the nice things about teaching mathematical modeling is that it’s incredibly relevant in a wide variety of contexts and to people working in a tremendous variety of fields. As I read the news each day, I keep an eye out for neat places where mathematical modeling shows up and today, I thought I’d share a few recent ones with you. One of the coolest is the recent discovery of evidence for the existence of a ninth planet (poor Pluto!) in our solar system. This discovery, announced by Caltech researchers in January of this year relies entirely on indirect evidence provided by a mathematical model. In this case, no one has actually seen the ninth planet, all of the evidence comes from observations of objects in what is known as the Kupier Belt. These objects are moving in ways that just don’t make sense…unless there is some other very large mass out there as well. By constructing a mathematical model of how these objects should move and inserting an unknown large mass into the model, the Caltech team has shown that the most likely explanation for the motions that are observed is the presence of something that isn’t observed, i.e. a ninth planet. How cool is that? Note that the reasoning of the Caltech team is exactly the same as the reasoning we’ve been discussing here. They observed a pattern, they sought to explain that pattern, they made a hypothesis about what could be causing that pattern, they built a mathematical model incorporating that hypothesis and showed that the model predicted the observed pattern, and hence can claim that the probability that their hypothesis is true is now very high. In this case their hypothesis happens to be the very exciting one that a previously undiscovered planet exists! In an entirely different direction, a team from the University of Aberdeen recently built a mathematical model that explains how things go viral. In this case, the team wanted to understand how things like the Macarena could suddenly become wildly popular, or how “Numa Numa” could garner more than two million views on YouTube in just three months, or more importantly how social movements, ideas, or products could catch on or fail to do so. Here, the team borrowed from mathematical models used in epidemiology, similar to those we explored in “Pictures and Stories,” and added in the effects of acquaintances, such as those we maintain through social media, to construct a new model that could examine the spread of ideas. The Aberdeen team showed that while an individual’s resistance to the spread of a “contagion” might be high, when bombarded by that contagion from many directions, such as happens through FaceBook or Twitter, transmission occurs, i.e. you go view Numa Numa as well. That synergy leads to explosive transmission and we say that something has gone “viral.” This is not only a wonderful example of the use of mathematical modeling to explain a real-world phenomenon, but also a wonderful example of the generalizability of mathematics and mathematical models. The same mathematics and the same types of mathematical models that can be used to study the spread of Ebola here have been used to study the spread of ideas. Another example that caught my eye recently was work that appeared in PLOS One, where researchers investigated the impact of deploying a test for a type of drug-resistant tuberculosis. The question here was whether or not having a test that detected the particular drug-resistant strain, in addition to existing tests for TB and another type of drug-resistant strain, would impact the spread of TB throughout a population. Knowing the answer to this question allows researchers to effectively direct their time and resources. If this third test would help contain the spread of TB, it would be worthwhile, but if it didn’t, that time and money could be more usefully directed toward something that would actually save lives. The answer here, arrived at through extensive mathematical modeling, was surprising. The additional test did nothing to impact the spread and hence is not worth developing or deploying. As you might imagine, this is the type of question that not only can be answered by a mathematical model, but can only be answered by a mathematical model.